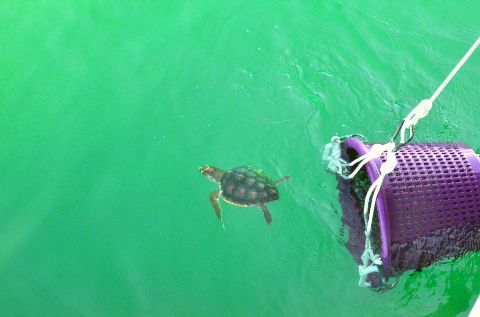 All sea turtles are endangered or threatened. Many factors have contributed to their population decline including development on nesting beaches, plastics in the ocean and over hunting. 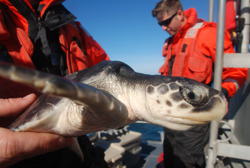 Five of seven sea turtle species live in North Carolina waters, including the loggerhead, the green, hawksbill, Kemp’s ridley and leatherback. 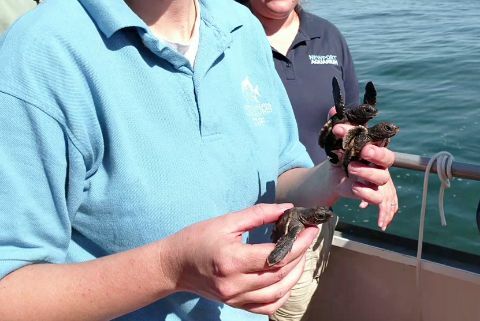 The Aquariums are committed to sea turtle education and taking action to care for sick or stranded sea turtles. 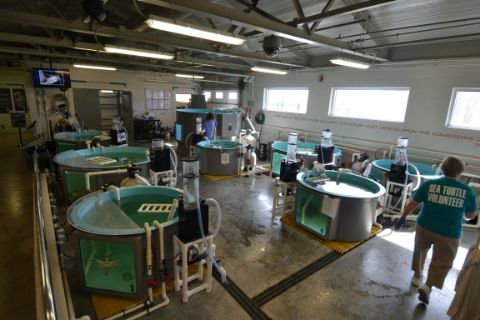 The Aquariums work with sea turtle stranding networks, nesting beach patrols and other Aquariums and sea turtle rehabilitation facilities to aid these animals. 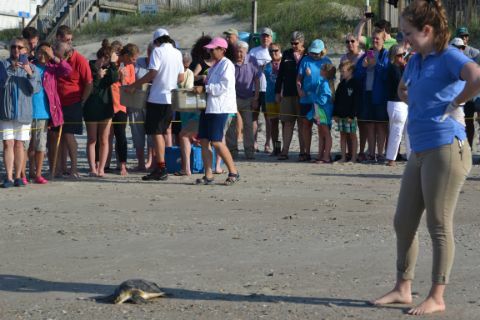 NC Aquarium at Pine Knoll Shores: On June 4, 2018, Seven rehabilitated sea turtles were released at the Eastern Regional Beach Access in Emerald Isle. 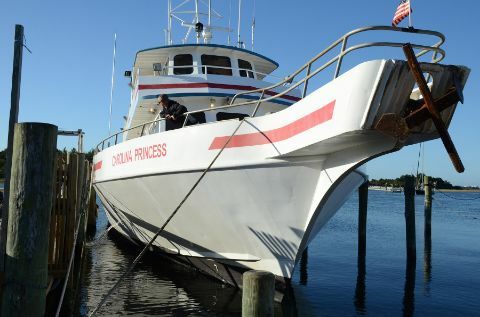 The six green and one Kemp’s ridley sea turtles were cold-stunned during the unusually drastic temperature drop late March. This late cold-stunning event, coupled with current warm water temperatures made it possible for a rare Emerald Isle beach release. 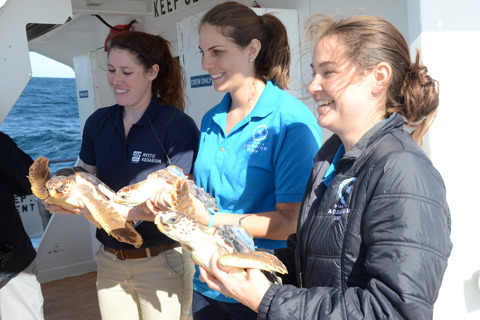 On Feb. 1, 2018, the Aquariums released 21 rehabilitated, cold-stunned sea turtles into warmer water 21 miles off the coast. 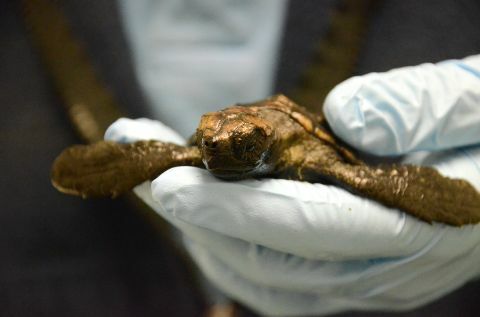 The mix of loggerhead, green and Kemp’s ridley sea turtles were cared for by aquarists at North Carolina Aquariums at Pine Knoll Shores and Fort Fisher since one of the cold snaps last year. 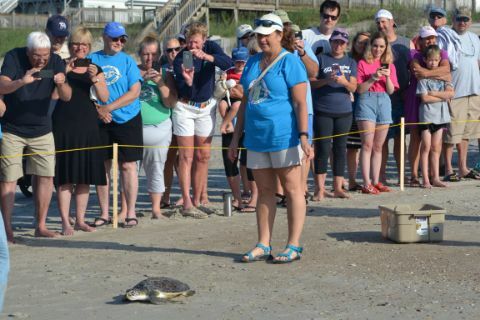 NC Aquarium at Fort Fisher: A 120-pound loggerhead sea turtle was released at Fort Fisher State Recreation Area, May 23, 2018. 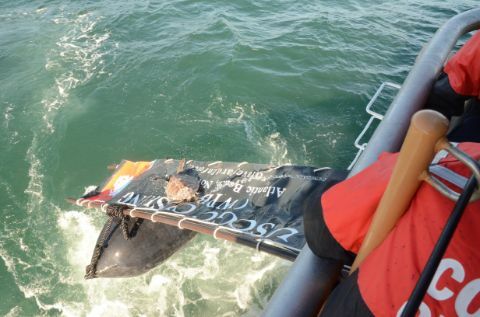 The loggerhead was found cold-stunned in the Outer Banks in December 2017. 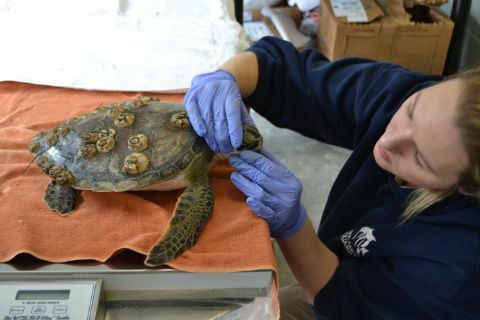 It received initial treatment for anemia, lethargy and malnourishment at the Sea Turtle Assistance and Rehabilitation (STAR) Center at the NC Aquarium on Roanoke Island in Manteo. 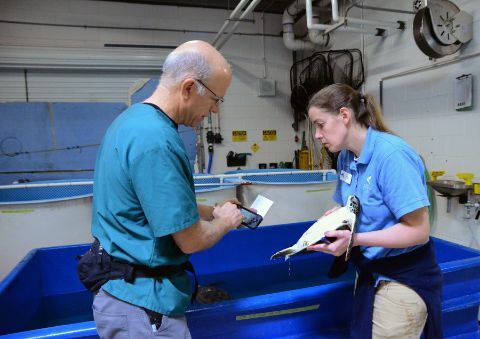 In January, the animal was moved to the NC Aquarium at Fort Fisher for long-term care and to make room for critically-ill sea turtles at the STAR Center. 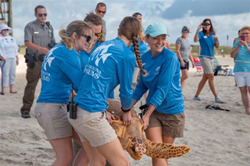 In addition, two loggerhead sea turtles were released to the Atlantic Ocean in October 2017. 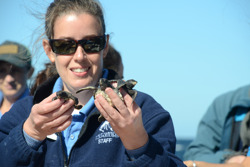 The turtles received care from the Aquarium at Fort Fisher team for more than a year. 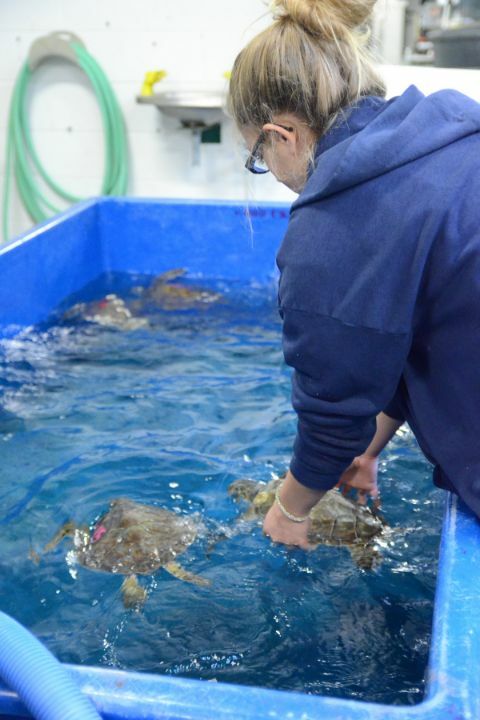 NC Aquarium on Roanoke Island: Sea turtles stranded by cold-stunning on the Outer Banks are being treated by technicians and volunteers at the North Carolina Aquarium on Roanoke Island’s Sea Turtle Assistance and Rehabilitation (STAR) Center. 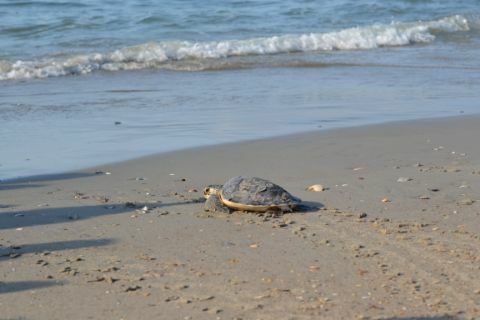 Since January 1, 2019, colder weather has resulted in an increase in turtles being found washed ashore from Hatteras to Ocracoke. 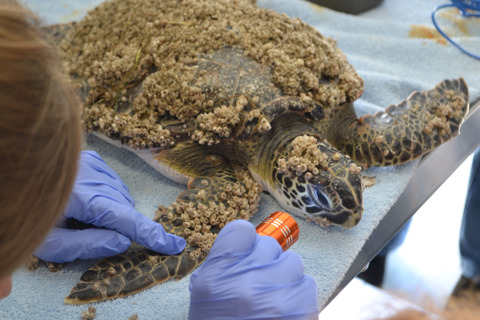 As of January 23, there were 37 turtles being treated in the STAR Center: 20 green sea turtles, 13 Kemp’s ridley and four loggerheads. 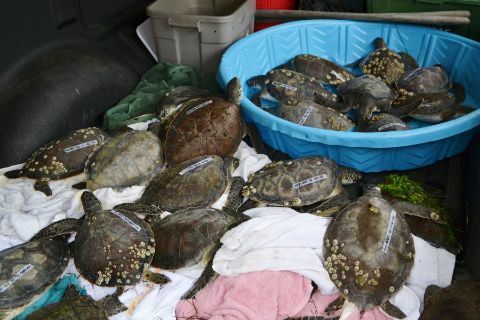 Each winter results in the arrival of some cold-stunned turtles, but the number of turtles recovered and in need of treatment varies. 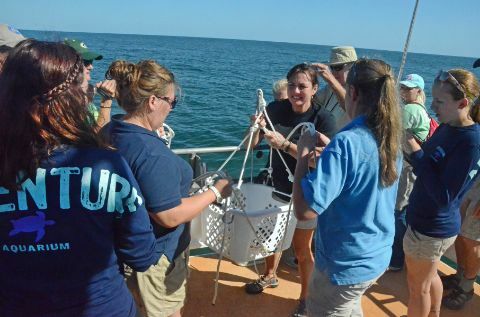 With the cooperation of partners like the Network for Endangered Sea Turtles (NEST), the US Coast Guard, the National Park Service and other agencies, the STAR Center works to release as many of these turtles back to the ocean as possible. 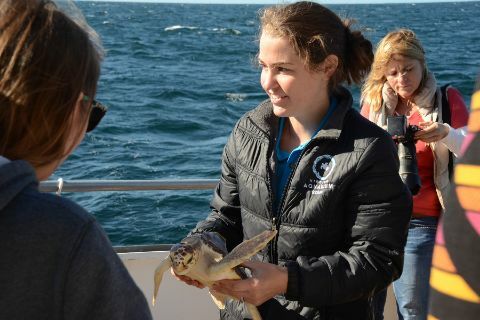 Many of the sea turtles that the NC Aquariums release are participants of the sea turtle loan program, which allows several aquariums across the nation to participate in the care of this endangered species. 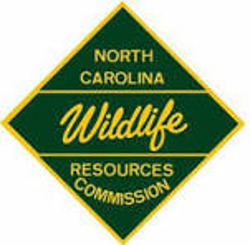 The Aquarium collaborates with the North Carolina Wildlife Resources Commission (WRC) to help save numerous distressed hatchlings that, for various reasons, would not survive without assistance. 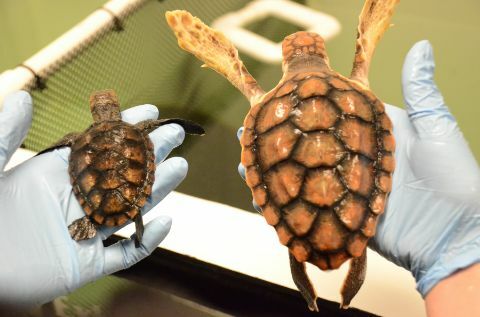 The Aquarium provides a safe haven for dozens of tiny turtles, brought in by the WRC volunteers from across Bogue Banks, whose chances of survival would be slim due to injury, weakness, weather or negative human interference. 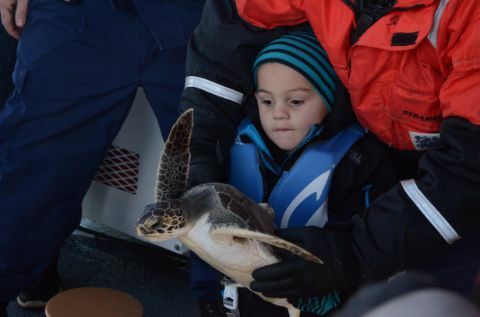 Some of the young turtles act as animal ambassadors and help further the conservation message. Their specialized habitats at each partner aquarium accredited by the Association of Zoos and Aquariums allow for a unique educational experience for visitors. 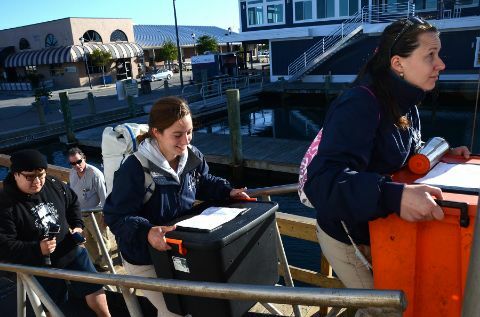 Programs introduce these endangered or threatened species to school children and other groups. 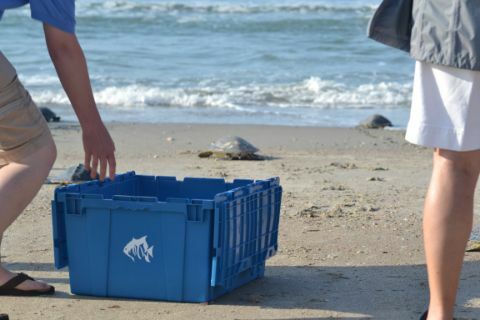 Each year, these ambassador turtles are released with the other sea turtles ready to return to the wild. In 2018, seven aquariums participated in the loan program – National Aquarium in Baltimore; Newport Aquarium in Kentucky; Adventure Aquarium in New Jersey; Mystic Aquarium in Connecticut; The Maritime Aquarium at Norwalk, Connecticut; Albuquerque Aquarium, New Mexico and the Virginia Living Museum.